Pine Island Glacier, on the West Antarctic Ice Sheet (WAIS) is the largest single contributor to sea-level rise in Antarctica. The stability of the WAIS and its likely contribution to sea level rise is the focus of international research efforts. This month (January 2014) sees the publication of new research, the completion of the first leg of a major ice traverse, and the start of a ship-based research cruise to the seas around Pine Island Glacier. Reporting this week (13 January 2014) in the journal Nature Climate Change an international team of scientists says that recent and rapid thinning of Pine Island Glacier has probably reached a point of no return. This glacier currently contributes 25 per cent of the total ice loss from West Antarctica, and this is likely to increase over the next 20 years. In recent years the point at which the glacier ice separates from the land to become a floating ice shelf (known as the grounding line) has retreated inland by tens of kilometres. 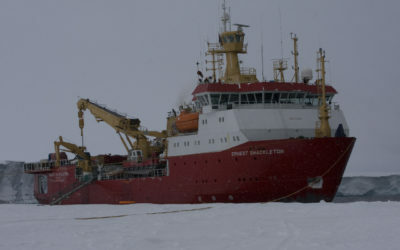 Understanding the cause and implications of this retreat is paramount for international investigations including the EU-funded Ice2sea programme, the NERC-funded iSTAR programme, and the British Antarctic Survey’s Ice Sheets and Polar Oceans programmes. Most of the bedrock of WAIS lies below sea level and deepens towards the interior of the ice sheet. Marine ice sheets resting on such reverse slopes have the potential to retreat in an unstable and catastrophic manner. The fact that Pine Island Glacier is currently retreating and thinning more rapidly than any other ice-covered area on earth is a major concern for scientists. A big challenge for glaciologists looking to make projections about future sea level rise is that no one glacier computer model has sufficient data sources to create an accurate simulation. In the Nature Climate Change paper scientists from France, Britain, China, and Finland describe how they joined forces to provide the most detailed and comprehensive study of the stability of the Pine Island Glacier so far. 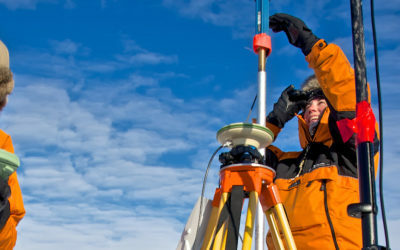 Using field observations combined with data from three different ice-flow models containing information about the bedrock topography beneath the glacier, the ice surface features, ocean melting and atmospheric conditions, the team created simulations of how Pine Island Glacier will change over coming decades. All the models agreed that the Pine Island Glacier has become unstable, and will continue to retreat for tens of kilometers. Meanwhile this month, out on the ice a team of UK scientists is heading to BAS’s Rothera Research Station after spending weeks deep-field on the first leg of a major NERC-funded research expedition to investigate what’s causing the rapid ice loss from Pine Island Glacier. During an ambitious over-ice crossing by tractor train (a traverse) this team deployed radar and seismic technologies to investigate the variation in ice-flow from the ice shelf up the glacier and into its tributaries. They are testing the hypothesis that it is glacier bed conditions that are responsible for the fact that the tributaries of Pine Island Glacier appear to be thinning at different rates. The iSTAR Programme is not over for this season yet. The Traverse will move to its overwinter location, whilst supporting further iSTAR instrument deployments. The next part of the iSTAR mission is the research cruise onboard RRS James Clark Ross which departs for the Amundsen Sea later this month. BAS oceanographer Pierre Dutrieux is a member of the iSTAR team. Earlier this month, publishing in the journal Science, Dutrieux reported a 50 percent decrease in melting from 2010 to 2012 of the floating ice shelf into which Pine Island Glacier flows. This reduction may have been induced by a La Niña event in the tropical Pacific. Ice2sea brings together the EU’s scientific and operational expertise from 24 leading institutions across Europe and beyond. Improved projections of the contribution of ice to sea-level rise produced by this major programme funded by the European Commission’s Framework 7 Programme (grant agreement 226375) informed the fifth IPCC report. In 2007, the fourth Intergovernmental Panel on Climate Change (IPCC) report highlighted ice-sheets as the most significant remaining uncertainty in projections of sea-level rise. 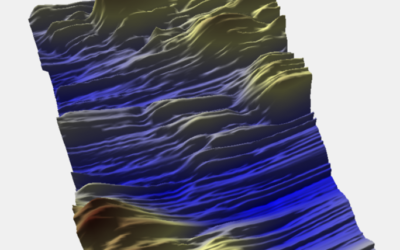 The retreat of Pine Island Glacier controlled by marine ice-sheet instability by L Favier, G Durand, S L Cornford, G.H. Gudmundsson, O. Gagliardini, F. Gillet-Chaulet, T. Zwinger, A. J. Payne and A.M. le Brocq is published in Nature Climate Change. The paper Strong sensitivity of Pine Island ice-shelf meting to climatic variability by P. Dutrieux, J. De Rydt, A. Jenkins, P.R. Holland, H.K. Ha, S.H. Lee, E. Steig, Q. Din, P. Abrahamsen and M. Schröder was published in Science.